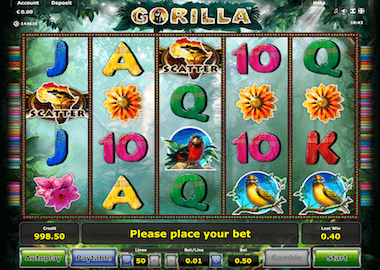 The Gorilla Slot is a typical Novomatic game with five reels, three rows and 50 paylines. Visually, the game has the same appearance as all games from the Novoline series only here is the jungle the set of the slot. From 50p you can spin the reels up to a maximum bet of £ 50. The slot is only playable on desktops and land-based casinos if you like. A mobile compliant version of the game does not exist. As is so often the case with Novomatic Slots, the Gorilla Slot is all about the Free Spins feature. Extra Wilds land here for bigger profits on your reels. Symbols and Payouts: The symbols of the Gorilla Slot could not be simpler. You play here with a few theme symbols and playing cards symbols. The latter are not, as often, the low paying symbols, but also pay up to 800x your bet for a combination of 5 identical symbols. These playing cards are complemented by two flowers, two birds and the gorilla symbol itself. This has no extra function, but the highest payout when it lands on your reels: 2000x your bet. Wilds and Double Up feature: Other symbols of the Gorilla Slot are the Scatter Symbol (the african map) and the Wild Symbol which is the mask. Incidentally, you can double any win of the game again. This double up function is known by many Novomatic Slots. Click on the Double Up button after any win. After that, two playing cards appear, of which you must choose one. In case you win, your amount is doubled. You can usually use this feature 5 times in a row. Free Spins feature: The Free Spins feature is the most important bonus feature of the Gorilla Slots. To activate it you have to land 3 scatter symbols on your reels, which is the Africa map. You also get an instant win of 400x your bet. You can extend the feature by 5 additional free spins during the free spins with three additional scatter symbols. During the feature lands with every songle spin a Wild Symbol on the reels 2, 3, 4 and 5. This means that bigger prizes are almost guaranteed! The Gorilla Slot is not an insanely interesting game, but if you activate the Free Spins feature, you can land really big profits. The top prize of the game is still £ 100,000! You can play the slot here for free. Click on the Gorilla Slot Banner above. You can also play more Novoline slots here for free. Recommended Novomatic Casinos are the Energy Casino, LVbet Casino or the famous Rizk Casino. In all mentioned UK online casinos you receive bonuses and free spins after your registration in the casino!